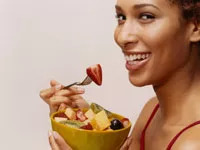 Barriers women cite for not eating more produce include high cost, lack of availability when eating out, and lack of thoughts for ways to eat more fruits and veggies or to prepare them. Don’t balk on price: Fruits and vegetables are really a bargain. What’s costly is the price you’ll pay for not consuming enough of them. You really can’t afford to not eat them when you look at the price of health insurance and health-care costs that you can be saddled with if you don’t. Don’t be intimidated: Cook what you know and like. Sure, I don’t know what to do with eggplant and artichokes, but broccoli is easily stir-fried, and there’s nothing to making tossed salads. Be the first to comment on "Americans Get an F in Eating Fruits and Veggies"